Oh Hillary; the partner in crime is so cute. but why doesn’t he have blond curls? I was thinking emo hair too! Why is it so rare to see boy dolls? He is fantastic! I LOVE him, he is so retro and has a naughty little face! Very retro, to me he looks like the guy out of the Monkees who always wore the hat? His pants and shoes – so cute. 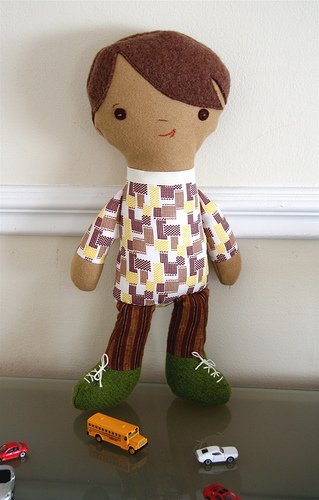 He’s a little mod boy doll! So cute! oh my god — he’s groovy! love your fabric choices and his mod ‘do. He is WONDERFUL, he does look like a 60’s mod-boy. I’ve known SO many little boys who wanted a doll that looked like them – this little guy is perfect!! He looks just mischevious enough to be fun, but not enough to start pulling the girl dollies’ braids and making them cry. So adorable! He looks like a sweet little guy! Oh he’s a dapper little guy. Love his haircut! He looks a very cool young man! He does kind of have a Michael Nesmith thing going on, doesn’t he? Love him, and think that his mouth is brilliant…. OH MY GOD HE IS TOOOOO CUTE! I MEAN CARS CRASHING CUTE! Oh my gosh,he is fabulous!! his expression is perfect, the hair, the fabrics…..
oh my gosh, I love how he has a personality, how you set him up to lean just slightly to the side. eek! He is just perfect! Oh Boy! He’s ready for some snips and snails! Sheesh. That’s one cute boy. Will he have a puppy dog friend? Good gravy! I love him. Henry needs to have a little pal just like him! Oh, he is perfect! I so want to make him for my son! what a gorgeous little urchin! I just adore him and have a little boy who would love a doll like that. You’re on a winner! Ack! SO CUTE! The hair is perfect. There need to be more boy dolls out there! He reminds me of pictures of my baby brother in the 70s. So good! I love the expression on his face! Darling! He just so freakin’ cute!! I am squealing with glee. How cute is he??????!!!!!!!!! AGH! Adorable! PLEASE sell these patterns, PLEASE!!!!!!!!!!!!!! Fabulous, perfectly fabulous. I agree, it’s great to see some boy dolls. I love all of your stuff, but this is too much! I love everything about this little guy. Perfect! OM! He is totally Peter Brady. I love him how cute. I love the hair, he is a very handsome little guy! Oh my gosh! That hair is to die for! Hooray for boys! I have four of them myself so this is very exciting! aghhh – who would have thought it possible for a guy to be so cute?! Those lace up shoes! That adorable haircut! His mischievous grin! He is soooo cute! It’s so hard to find adorable stuff for boys. Would you consider making him into an embroidery pattern? My little boy is so jealous of his big sister’s girl embroideries I bought from you. And maybe offer a whole line and make them printable patterns so I won’t have to set a timer to make sure I don’t miss out on the sale-I am aiming high-ha-ha!! Thanks for all the great inspiration-you are so creative. So adorable! I just love his outfit. Oh gosh, I hope you’re selling this new pattern. I can’t wait. Astro boy is adorable. The cutest little boy doll I have ever seen! What a handsome fellar! I love the fabrics you chose, and the lace up shoes- how cute is that! He looks great. I love the pants especially. Is it possible to have a crush on a doll? He looks like a boy in McPantses’ kindy class who is so cute that I almost can’t stand it! oh i love him !!! perfect ! He is so cute Hillary, he looks a bit like a guy I used to date, but that’s definitely ok, we parted on good terms. OHMIGOSH he’s the cutest!!!!!! just love the fabric choices–what is that shirt fabric? it looks like it would be a knit. congrats on a fabulous design! Now he is cute! Love the hairdo! We need more boy-dolls !! Truly, you are awesome!! I’m so happy I stumbled across this blog, ’cause it’s definitely going on my list of favorites. Keep up the wonderful work! I agree — cutest thing ever, and he looks just like my son! wow-he is cute and looks like he is in the coolest band ever. and nice cars! Oh my so sweet! I just want to give that playful boy a quick hug – because I know he is a boy and has no time for long ones! Fab job, as always. handsome he is. like his kind of a smile.